The thickness of body piercing jewellery is measured in lots of different ways and it can be hard to make sure that you are buying the right size – especially if the shop you are browsing uses a different gauge system than the one you are used to. Luckily there are easy ways to convert piercing gauges and make sure you get the right size! The three most common ways to measure piercing jewellery are: in millimetres, in inches and using AWG or American Wire Gauge. The American Wire Gauge system is commonly referred to simply as â€œgaugeâ€ or â€œpiercing gaugeâ€ and is used mostly in the USA, while many UK and European manufacturers use millimetres. At BodyJewelleryShop.com we use millimetres primarily but we include AWG gauges as well. A gauge conversion chart is probably the simplest way to convert standard piercing gauges into millimetres. There are hundreds of gauge charts available online and I recommend using a gauge chart if you know your size but simply want to convert it into another system. Unlike simple conversions such as volume and length, converting gauges does not rely on a simple equation, so it is best to find a comprehensive gauge chart like this one on Wikipedia. If however you want to see the different gauges and sizes in life size, I recommend using our new Gauge Conversion Tool. 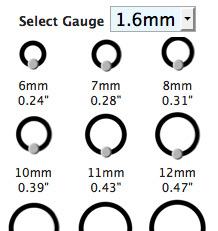 We developed this tool to not only convert piercing gauges to millimetres but also to show you exactly how big the different gauges are. It actually shows you the gauges life size on your computer screen, so you can hold an existing piece of jewellery up to the screen for comparison. Our customers love using the Gauge Conversion Tool because it shows you exactly what size jewellery you are buying â€“ which avoids any disappointment when you receive your jewellery! This entry was posted in How To Measure Jewellery and tagged Body Jewellery, piercing gauge sizes on May 31, 2010 by Piercing Guru. Our new gauge conversion tool shows you exactly how big your jewellery will be â€“ not only for the gauge but also the ball size, internal diameter and length. It shows you the different jewellery sizes true to life â€“ so you can see exactly what size your jewellery will be. Itâ€™s also great if you have a piece of jewellery that fits and you want to match your new jewellery to that item. You can simply hold your existing jewellery up to the screen and see which of our products will be the right size. Weâ€™re proud of the new piercing gauge conversion tool because it should make everyoneâ€™s life easier â€“ itâ€™s easy to see what size jewellery you need and you wonâ€™t get any surprises when you receive your jewellery â€“ with the new conversion tool you can be sure that your piercing jewellery is exactly the size you wanted! Click here to use the Piercing Gauge Conversion Tool or look for the link on any BJS product page. This entry was posted in How To Measure Jewellery and tagged Body Jewellery, piercing gauge sizes on May 26, 2010 by Piercing Guru. Clip-in balls and accessories have dimples on either end, which clip into the gap of ball closure rings. Clip-in balls and accessories are measured in diameter, across the widest part of the piece, whether it is a spherical ball or a flat disc, or a star. The size of the clip-in accessory will correspond to the gap in your ball closure ring. The size of your clip-in accessory must be the same as, or slightly larger than the gap in your ball closure ring, so that it â€˜clipsâ€™ into the ring and is held securely by the tension of the ring. Sometimes the use of â€˜ring opening pliersâ€™ will help to fit clip-in accessories if it is too fiddly! This entry was posted in How To Measure Jewellery on August 21, 2009 by Piercing Guru. â€˜Double flaredâ€™ flesh plugs and flesh tunnels (also known as saddle plugs) are always measured at the inner-section of the piece, in between the two flares. This corresponds to the section that sits inside the stretched piercing, with the flares on each end being slightly larger to keep the flesh plug or tunnel securely in place. The measurement is still referred to as the â€˜outside diameterâ€™ as it is corresponding to the outer diameter of the stem that sits inside your piercing. This entry was posted in How To Measure Jewellery on August 15, 2009 by Piercing Guru. Threaded balls and accessories (charms) are measured in two places. The â€˜gaugeâ€™ will be the size of the threaded hole in the ball, which fits the stem of your threaded body jewellery. For example, if you have a labret stud with a 1.6mm (14ga) gauge, you will need a threaded ball that also has a 1.6mm (14ga) gauge to be compatible with the stem of your labret stud. The size of the threaded ball or accessory will be the measurement in diameter, across the widest part of the piece, whether it is a spherical ball or a flat disc, or a star. This entry was posted in How To Measure Jewellery on August 13, 2009 by Piercing Guru. Stretching jewellery, stretching tools and other large-gauge accessories (including flesh tunnels, flesh plugs, top hats, flesh tubes, eyelets, crescents, claws, tapers, spirals and eardrops) are measured at the section which sits inside the stretched piercing. This is usually the widest part of the piece of jewellery, although â€˜double flaredâ€™ jewellery is always measured at the inner-section of the piece, in between the two flares (explained below). Flesh tunnels and other stretching jewellery is measured by the â€˜outside diameterâ€™ of the section that sits inside the piercing, often confused with the â€˜internal diameterâ€™. The â€˜internal diameterâ€™ is not the measurement taken for stretching jewellery because this would refer to the size of the inner â€˜holeâ€™ of a flesh tube or tunnel, which is not the correct measurement to take when fitting your piercing with the correct size. This entry was posted in How To Measure Jewellery on August 12, 2009 by Piercing Guru. Labret Studs are measured in two places. The ‘gauge’ meaning the thickness of the bar, corresponds with the thickness of your piercing. The length of the labret stud is measured as the distance in between the ball and the flat plate. This entry was posted in How To Measure Jewellery on August 11, 2009 by Piercing Guru. The length of a bananabell is measured as the distance between the ball at either end. This relates to the distance between the holes in your piercing. The ‘gauge’ is the thickness of the bananabell, relating to the thickness of your piercing. Navel (belly) piercings are initially pierced at a standard 1.6mm (14ga) size but can also be stretched to larger gauges if you choose to do this. This entry was posted in How To Measure Jewellery on August 7, 2009 by Piercing Guru. Barbells are measured in two places. The ‘gauge’ meaning the thickness of the bar, corresponds with the thickness of your piercing. The length of the barbell is measured as the distance in between the balls or threads at each end of the stem. This entry was posted in How To Measure Jewellery on August 4, 2009 by Piercing Guru. Ball closure rings are measured in two places. The ‘gauge’ meaning the thickness of the ring, corresponds with the thickness of your piercing. The ‘internal diameter’ is the width of the inside of the ring at it’s widest point. This entry was posted in How To Measure Jewellery on July 31, 2009 by Piercing Guru.